A permanent fixature in Browne's Addition, Anyimieke "Bird" Culvy, right, invites people to read to her friend, Harry Rautanen, who is blind. A woman sits in a corner lot just out from under the railroad tracks on the edge of Browne's Addition. Rain or shine, hot or cold, the little white-haired woman is there. Always. Anyimieke Culvy is known as "Bird" by the folks who frequently wander past her small white car in the Ace 4 Space parking lot. 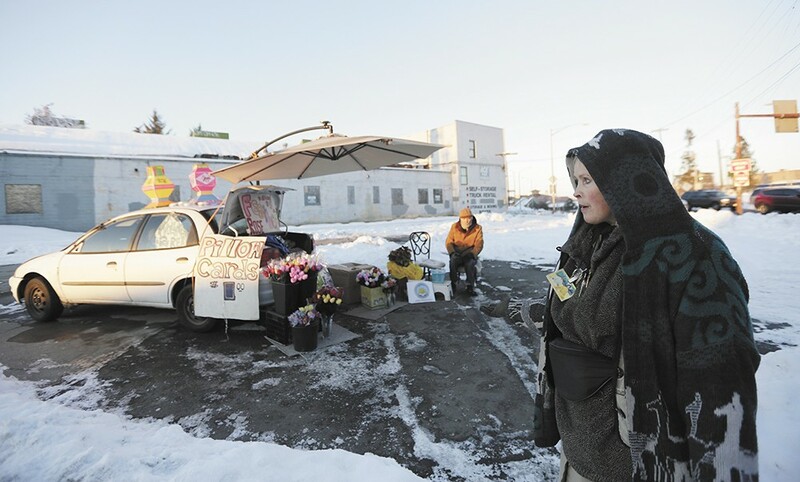 Boxes of flowers spill out of her trunk and brightly colored signs surround her, asking passersby to "Read to the blind," and advertising her "Roses for Sale." An older man with a grizzled beard sometimes sits next to her. The man is Harry Rautanen. He's blind, and they've known each other for more than 10 years. Rautanen used to be an erratic drunk until Bird took a shine to him. She sobered him up and helped him rein in his violent outbursts. He's come a long way, he says, from the days when he would stumble drunk around Spokane and yell obscenities. "Well, before when I was drinking alcohol, I didn't have much of a purpose," Rautanen says. "And since I've been here with her, I have more meaning in my life." Rautanen, who has a history of mental illness, was accused of killing his mother in Oklahoma in 1994. He now lives above the Ace 4 Space, and says Bird helps take care of him regularly, washing his clothes, making sure he eats healthy food, cutting his hair, keeping him company. The charge against him in Oklahoma was dropped due to a lack of evidence. If you stop and talk to Bird, she'll tell you about her mission to promote world peace. If you're so inclined to read to Rautanen, she'll offer you several books from which to choose. His favorite, he says, is Rev. Sun Myung Moon's autobiography, As a Peace-Loving Global Citizen. Moon, who died in 2012, was a Korean religious leader known for founding the Unification Church, widely considered a cult, and claiming himself a "messiah." Bird will most certainly tell you about her beliefs in "true love principles" and "family as church," but she doesn't try to force her religion on anyone. "We need to be living for world peace and for the sake of others," she says. "I'm not about 'Be like me, think like me, and join my church.' I come here with my own ideas from my own heart." Beside helping Rautanen, she does what she can to help those who panhandle or pass through the area. She refuses to give money, but will hand out a winter coat, a new pair of shoes or a tarp to keep dry while sleeping outside at night. On a bright but chilly New Year's Eve afternoon, she recognizes a young man with a loaded backpack and long, matted hair shuffling by. "Hey, how are you?" Bird yells to the man. "I have that tarp for you." He turns, but doesn't respond and keeps walking. "Do you still need it?" she asks. "I have to take care of something first," the man finally responds.